Hello, everyone, and thanks for joining us for this week’s unSeminary podcast. Mark Crull, executive pastor at Northview Church in Indiana. Northview is a fast growing church with five campuses as well as online services. The church started in 1980 with 29 people meeting in an elementary school cafeteria and has grown to over 7000 attendees. So how does such a large church feel personal? Mark is here today to talk about how Northview gives back to their community and makes their congregation feel like more than just a number. Make your church something that the community would miss. // The staff at Northview wants to serve their neighborhoods so well that if they ever had to close their doors, people would miss them dearly. Investing in the communities where each of their campuses reside is a big way they give back. For example one campus has a property of 80 acres on which the church developed a 3K and 5K cross country course. This gift to the larger community was so well-received that now the church hosts events on these tracks for the state of Indiana as well as for the rest of the country. It’s a small way that the church has blessed others with what they’ve been given. Let the congregation and visitors feel valued. // “I think that one of the assumptions people have about mega-churches is that they’re impersonal,” Mark says. The staff at Northview rejects that notion and wants everyone who comes to their church to feel loved and valued. One of the ways they’ve done that is to be very intentional about using the twenty to thirty minutes before and after services to find people in the crowd that they don’t recognize, go up to them and say hello. These times are ideal for demonstrating that friendliness and warmth in the church. It can be harder to keep up with who you’ve met before in a larger church, and so it’s okay to ask someone, “Have we met before?” or “How long have you been coming to our church?” They understand that you’re in a large environment and meeting a lot of people each week. Do more than just weekend services. // What happens between weekend services is what distinguishes mega-churches from each other. Mark challenged his staff to handwrite three notes each week to people they’ve had contact with during the weekend services. It can be notes such as congratulations on the birth of a new baby or a marriage, or simple notes such as “Thanks for the great conversation.” It doesn’t have to be long, but a personal handwritten note can really connect the members and visitors to the church, creating a more intimate environment. You can learn more about Northview at www.northviewchurch.us. 01:11 // Rich introduces Mark Crull and welcomes him to the show. 01:39 // Mark introduces us to Northview Church. 03:16 // Mark talks about giving back to the community. 05:30 // Mark talks about the importance of connecting people and communicating with the staff. 09:20 // Mark and Rich discuss the art of communication. 10:50 // Mark and Rich gives examples of how pastors connect and communicate during services. 13:10 // Mark highlights the importance of making megachurches feel warm and personal. 16:41 // Mark and Rich discuss the impact of hand written notes. 19:03 // Mark and Rich discuss the power of touch. Rich – Well hey everybody, welcome to the unSeminary podcast, my name’s Rich, the host around these parts. I am so fortunate that you tuned in today, so lucky that you would let us spend some time with you, I know that you’re really busy, you’ve got a lot going on at your church and we’re just honored that you’d pop us in your earbuds and tune in. 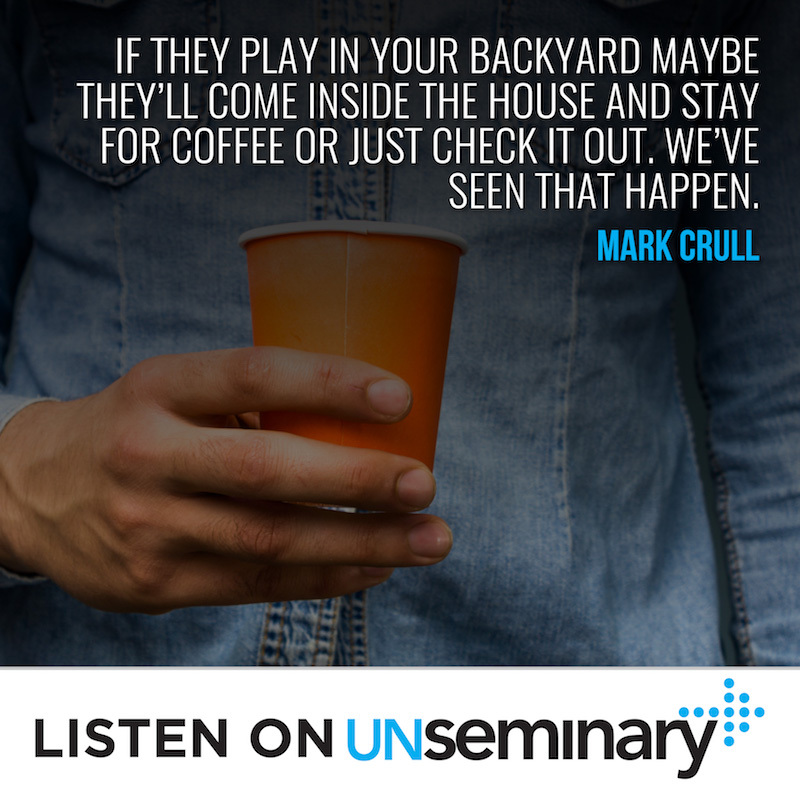 Today you’re going to be rewarded for that, we’ve got Mark Crull with us. He is the executive pastor at Northview Church. This is an incredible church, it’s a fast growing church, about 7 thousand people a weekend, they have 5 campuses plus Church Online. Welcome to the show Mark. Mark – Yeah, thanks Rich, I’m happy to be with you. Rich – Thank you so much. I wonder if we could start by you kind of telling us a little bit about Northview? If people were to show up this weekend what would they experience and then tell us about your role? Mark – Yeah, Northview Church started in 1980, 29 people met in a cafeteria in Carmel Elementary School and dreamed about making a difference in our community. So from that start the church has grown. We’ve had 2 pastors over the life of our church, our current pastor Steve Poe has been here since 1999 and he really brought to Northview the current culture and vision and kind of the outreach mindset. The church started under Tommy Paino who was an amazing man, an extremely gifted pastor, very shepherding, caring, build a great core group of believers in Christ. Tommy, by the way, died of Lou Gehrig’s disease, which was really, as you can imagine, difficult for the church to go through and then Steve came and brought the vision. We are on the highest point in our county in Indiana. Mark – So we are up literally on a hill, we have a big, kind of like an art piece on our property that is from Matthew about being a light on a hill and shining the light of Christ to our community and that’s really what we want to do. It’s that old premise and you’ve heard it probably a million times, “If your church left town, closed its doors, would anybody notice, would anybody care and would anybody cry?” We want to be one of those churches where if we left town people would cry in Carmel and all the different communities where we have multi-sites. Rich – Now what are some of those ways that you’re making a positive impact, what are some of those things people would miss if you were to shut your doors? Mark – Well just for example, here at our Carmel campus, we’re on 80 acres and we’re in a community of a bunch of over-achievers. We’re on the north side of Indianapolis, these people are all very professional and great at what they do and that bleeds down into their kids. So one of the things we did, for years all we did at Northview Church was mowed grass. Like I said, we’re on a hill, Indiana’s as flat as a pancake. Mark – So when you’re on a hill it’s beautiful but all we did was mow it and it looked pretty and it looked pretty and we met together as pastors and said, “How can we use our property and give it back to the community?” So we developed on our property a 3K and a 5K cross country course. Rich – Really, that’s cool. Mark – So fast forward to today and we host events for Indiana as well as for the country. We had the BIG EAST Conference Cross Country Championships here. Mark – We hold the Indiana High School Semi-State, the Middle School Championships. So we have events on our church property that we gather probably 7 or 8 thousand people for these huge running events. That’s one example of like, “Wow, if we close up and went away and this wasn’t here?” It’s kind of like a park like facility that we’ve created for our communities. That’s a small way, the thought is, if they play in your backyard maybe they’ll come inside the house and stay for coffee or have a coffee and just check it out and we’ve seen that happen, we know that this is happening. Mark – It’s not very impressive brother, but we do have sledding. This is the one place within a 20-minute drive, everybody comes to sled. Rich – Oh that’s cool, that’s really cool. One of the things I’ve heard, your reputation from your church is that, you’re obviously a large church, a lot of people, 7 thousand people by any stretch of the imagination is a lot of people, but how are you able to kind of transform that and really make it personal? How are you able to make sure that people feel like they’re getting cared for, even in that they’re just not another number in the crowd? Mark – Some people want their anonymity and if that’s the case we’re not going to harass people, we’ll let them just come and check it out and kick the tires, but for many people they are surprised by the feel that they get when they walk onto one of our campuses. So there are some things that we do that are very intentional to make that feel work, and one is, we have raised the bar on the 20 to 30 minutes before service time and after service time, so in between your service times and before. We feel like that is prime time, that is the one time every week where people are coming to you. You’re not trying to go out and track people down and get appointments and all that, everybody is coming to you and so you’ve got to be on and our pastors we say, “Guys we work weekends. I don’t know if you realize it, but we have a weekend job and when people are actually coming to us, that is time to be on,” if you want to say it that way. 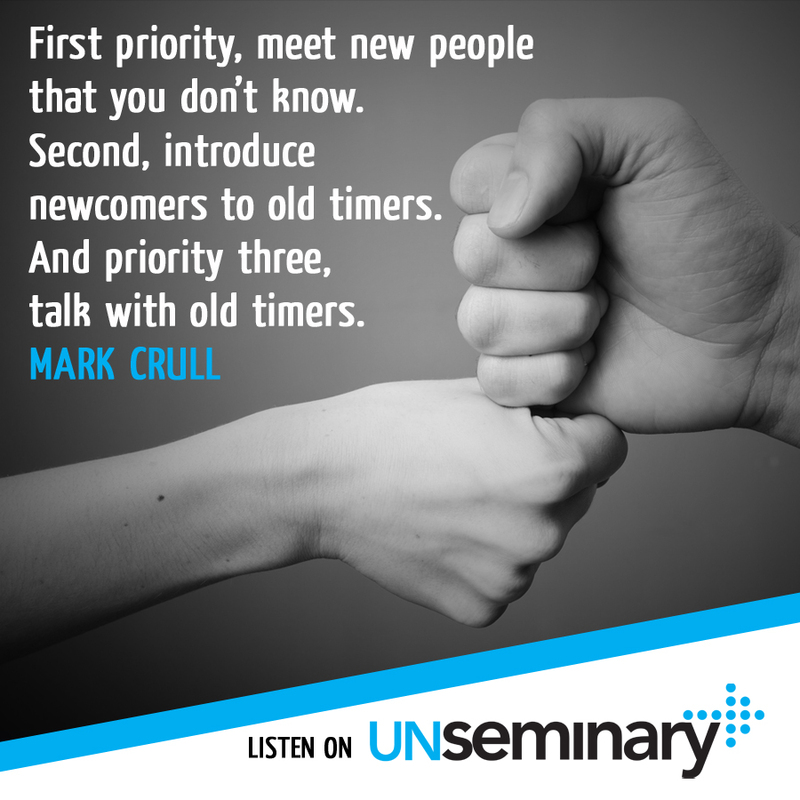 Mark – So we kind of prioritize during that window as pastors, what are our priorities? The first priority is find people you don’t know, you don’t recognize, go up to them and say, “Hello.” You don’t have to day, “Hey, I’m a pastor, what’s your name?” Just say, “Hey, I’m Mark, I don’t think we’ve met, what’s your name? How long have you been coming here? Really? Where do you live?” I never reveal to them I’m a pastor. Now, we have name tags and I’m wearing a name tag, it’s just printed off when you check in and it says ‘pastor’ on it, so they may figure it out and that’s fine if they do, but I don’t lead with that. So that’s the number one priority, find somebody you don’t recognize or know, introduce yourself, make them feel like you’re glad they’re here. Just before I move on, what’s some of the coaching, in that particular piece, kind of the working the lobby, working the atrium, what is some of that, that as you lead your team, how to have those interactions, what’s kind of a positive way? What do you say to people if it’s like, “I don’t know what to say,” what would you kind of coach folks to do in that instance? Mark – So there’s an art to tactfully saying, “I can’t remember your name or I think we’ve met, haven’t we met before?” People get that, people know you’re in a huge environment and they recognize you because you’re up on stage, service hosting or preaching or teaching or doing whatever you’re doing. But they are very gracious to give you that leeway. Rich – Then it kind of can domino down from there. What else are you doing to put all the strategies in place? Mark – It makes this really warm feel and connection. There’s a guy, a friend of mine, Jim Tomberlin, who used to be on staff at Willow, so Willow Creek, 20 plus thousand people. I got to spend a couple of weekends with Jim, just kind of shadowing him and that was what I was blown away by. Here’s a guy, a teaching pastor, on the lead team of one of the largest churches in the country, that guy worked the foyer, he was constantly around shaking hands, kissing babies. Rich – Not in a political way, in a, “I’m trying to connect with as many people as I can. I know I’ve got a short window here with folks.” So push back against, if people are like, “Oh, I’m not sure I’ve got time for that,” you know, leaders lean in on that, you can do that. Mark – And by the way, Steve is not an extrovert. Mark – He is an introvert. Very early on in his ministry he had a mentor model it for him and said, “This is the right thing to do.” So he has taught himself how to do that and is extremely familiar and comfortable with it now, but in his nature he’s not like wired for that. Rich – Right, absolutely. Cool, what else are you coaching your team to think about as one of the strategies to make the church feel small? Mark – So just with that lobby time, let me just wrap it up with this, meet new people that you don’t know, the second thing is, introduce newcomers to old timers and then priority 3 is, talk with old timers. Mark – So they’re really at the bottom of the pecking order with regard to that particular 30 minutes in the week. Mark – There are other times in the week where we can have coffee and catch up and all that. Mark – So that’s that. Another thing I would just share, as far as warmth and making a megachurch feel personal and all that is, I came back from a sabbatical, I was off for 12 weeks, we attended 16 megachurches, my wife and I, during the time off. It was really a neat experience, but it made me think that there are a lot of churches doing great weekend services and I’ve heard Hybels say and I agree, “It’s all about the weekend,” as far as that’s when everybody’s here, but what happens between weekend services is what distinguishes megachurches from each other. So in the past we’ve always just used like a generic kind of Northview Church thing for all of our notes, we all have this generic letterhead notecard and those are great, but I thought, “What if we came up with a line of pastoral notecards?” So our graphic people came up with like, Praying For You card, we’ve got a, Thinking Of You card, we’ve got a, With Deepest Sympathy card, we’ve got a, Happy Birthday card. Rich – Yeah, very cool. Rich – Right and there is something about the handwritten nature of those. As we become more and more a digital culture, when you receive a tactile thing that’s like handwritten, you see someone’s actual handwriting, as terrible as it is, it really does speak and I think 3 is a very tangible number, right? You think, “Okay 3, I can do that,” well back up, that’s 150 cards a year. If you’ve got a pastoral size of 10 staff, gosh you’re talking 15 hundred cards. In a church of 7 thousand, that’s a sizeable dent, that’s a reasonable number of people for you to reach out to. Mark – Yeah, it definitely makes a difference and I agree, the handwritten, and I’m older than you, but it’s not like I’m Mr. Journaler, but there’s something about receiving a handwritten note that stands out from an email or text message or whatever. Rich – Very true, I think that’s great. I love the idea too of, kind of almost starter ideas, you know, “Here’s some ready to go…” even for your team, because it gives them categories to be thinking about as they’re interacting with people. Are you taking notes on the weekends, like a notepad or something to remember that? Rich – What are you doing on that front? Mark – You know, I used to, I used to be in the habit, I no longer am, but I would carry around a worship program and every conversation I would have I would write their name down and try to see them again the next weekend. So that’s more going back to the lobby, atrium kind of strategy. Mark – But then off of that you could write your notes like, “Oh, I talked to them, they mentioned about their child who was dyslectic,” or who knows what it is, and you can write something that would be meaningful to them. I no longer do that. In some ways, back when I started, we were a church of a thousand, so it’s gotten, as we’ve gone multi-campus and all that, you do feel like you start losing control of who’s coming and who’s going and all that. Rich – Yeah, we encourage the people people on our side of church, these are things called Levengers, they’re like a notepad. We explicitly say, “Please don’t take notes in your phone because it looks like you’re disconnecting. Rich – But the Levenger, it basically is like, they all it a pocket briefcase, it’s a little notepad thing that you can stuff cards into and it makes it very easy for taking notes. So in our particular church it’s become a pattern; you see all our campus pastors, campus coordinators, anybody that’s charged with this side of what we do, they’ve got their Levengers and then on Monday you’ll see all those folks pulling out those cards, “Oh yeah, I’ve got to call this person. I’ve got to make this note. I’ve got to write this deal for sure.” So we’ll put a link in the notes for more about those. Mark – A great idea. Rich – What else, you know, strategies to help make a church feel personal? Mark – This is one that is more personal to me, I wouldn’t say that we’ve done a big vast training and teaching to all the pastoral staff. Rich – Okay, yeah, yeah. Mark – I’m kind of a late adopter when it comes to technology and all that, it’s just my nature, it’s just who I am and you’ve got to be careful in today’s world about touch, but touch is one of the God given senses that we are created with and I think there is a huge amount of power in just touch. Look at Jesus Christ himself and the miracles that he did, almost every one of them is associated with some kind of a touch, whether it’s healing the blind guy, the 12-year-old girl in [Inaudible 00:19:54] or whatever it might be, Jesus was kind of hands on. Who knows, the people that are coming to Northview Church on the weekend, this could be the only time that somebody actually hugs them. Mark – Which is kind of a sad… Listen, I am not a touchy person, I grew up in a family, I can remember as a young adult, newly married and determining that I was going to hug my dad because I grew up never hugging my dad and it was like hugging a board and I wasn’t very familiar with it either. Mark – But we can learn these things, we can learn to be. So whenever, in the lobby and atrium, as I’m interacting with people, I think there is power in putting your hand on a person’s shoulder and just actually, just touching them. Rich – So true. Yeah. Mark – Or giving them a hug or patting them on the back or whatever. So again, when Steve is going up and down the aisle, he’s not just having conversations with people, he is engaged with them on a touch level because it is a powerful feeling, there’s warmth in that. So if you have a pastoral staff, obviously all of this in the context of appropriateness. Mark – A pastoral staff who is engaged at that level, it makes your whole community feel warmer, I mean, that’s a part of the way God created us. Rich – Absolutely and there’s a lot of variety in that right? Even someone who you’re relatively new with, you can reach out and give them a touch on the shoulder, on the elbow, “It was so nice to meet you,” you know, the side arm hug. Mark – Yeah, yeah, yeah. Rich – But I agree, that’s a practical nuanced tip there, that hey, even how we’re physically engaging with people, obviously like you said, in an incredibly healthy manner, is important for sure. That’s good. Mark – I give a lot of high fives. Mark – Especially to the kids and all that. I’m always engaged in the high five or up top or down low or you’re just kind of like engaging people at more than just a conversational level. Mark – There’s a physical aspect to it. Rich – That’s wonderful. Anything else you want to share with folks before we move on, on how to make a megachurch feel personal? Mark – I just think you’ve just got to be intentional. I think our natural tendencies in general, is to be passive and step back and we’ve got to teach and train and model for all the pastors in our church to be intentional and be engaging with people on the weekends and then to write our notes throughout the week and make the phone calls and all that stuff, but it’s just intentionality in my mind.